Motiv continues the popular Trident high performance ball line with the Motiv Trident Abyss. This ball introduces the Coercion HV3 Reactive Solid coverstock and pairs it with the proven Turbulent weight block. This combination produces awe inspiring motion in heavy oil conditions by clearing the front part of the lane, hooking hard in the mid lane while storing energy to blast through the pins. This ball is a great for speed dominant bowlers as well as low rev bowlers looking for increased hook. When you pair the Coercion HV3 reactive solid cover stock with the proven and very successful turbulent asymmetrical core, the Trident Abyss was born. This combination produced the strongest ball ever created by MOTIV. The HV3 cover was altered to excavate through heavy oil conditions with still allowing a super strong mid-lane. Being a speed dominant player with 500 plus rev rate, I was extremely impressed when I tried the ball for the first time. Listing to other bowlers tell me I needed to literally move 5 left (right handed), I wasn’t certain this was the case for me since I roll the ball at 19mph. I made the adjustment based on feedback from others by sliding at board 40 and rolled it over the 5th arrow out to the five board. The ball cleared the front part of the lane, hooked through the mid lane and provided great energy when exiting through the pin deck. I can move further in, open up my angle even more and still see this ball get down-lane with enough energy to get through the pins. Competitive bowlers wanting a very strong piece that provides control on heavily oiled patterns will want the Trident Abyss in their bag. Description: The Trident Abyss is the third Trident in the very successful series. It is the first Trident however to have a solid coverstock (Coercion HV3 Reactive). The box finish is 2000 Grit LSS (Laser Scan Sanded). It uses the same Turbulent Core, with an RG of 2.49 and a .054 differential. According to MOTIV’s hook scale it is tied for their most hooking ball produced, however I think it’s noticeable stronger than the Jackal Rising. Reaction: Let’s get down to it…it is the most hook I’ve ever had, it is not equal to the Jackal’s, it is more. Everyone says a ball really hooks and the newest one always seems to be the strongest, so I really want to back it up with a description. Being asymmetrical it does start up soon, but it is not too early where all the hook is only in the front part of the lane. The hook potential is evenly disbursed throughout the entire lane, front, middle and backend. You will notice the original Trident is now in the Heavy Oil/Angular spot on the Ball Guide (http://www.motivbowling.com/ball-guide/). The NEW Trident Abyss may be in the same row but it is placed in the Heavy Oil/Smooth location on the ball guide. I have had the ball for a while now and it easily has 20+ games on it already. I feel the cover has really held it’s out of box surface grit as well, it has barely if at all, shined up in 20 games. This is going to be a ball that will make my bag for just about every tournament. It allows me to get in ahead of some of the other players a little quicker and stay ahead of the moves all while allowing me to control the lane with ease. No doubt a ball to be utilized on say the USBC pattern for doubles/singles that has been laid out the last few years. Comparisons: The original Trident in my opinion is cleaner and more angular than the Trident Abyss, as stated earlier and shown on the latest Ball Guide. I see the Trident Abyss suited best on fresh and heavier conditions. Thus far in league it isn’t a ball I have stayed with for an entire 3 games, but for me there isn’t an asymmetrical ball that I could probably stay with for 3 games on “most” league conditions. Compared to a Villain, I feel the Villain is cleaner and just picks up a little more down lane, in addition to it forcing me to move at least a zone if not two away from the puddle. I think MOTIV’s last 3 releases could round out an entire 3-ball lineup…The Trident Abyss is your strongest couldn’t ask for more hook ball, the Rogue Blade your benchmark ball that isn’t too strong or too weak without being too smooth or too angular and finally a Hydra which is so clean and retains energy on even the lightest or driest of patterns. Summary: It’s very apparent what you get with the Trident Abyss, hook in a box. You also are getting a lot of control, yet no hesitation down lane. This is currently one of, if not the strongest ball on the market. Has a different shelf appeal too with the two-tone gray scheme. Holy hook in a box, Batman! Honestly, when first opening the packaging I thought that a piece of the parking lot was shipped instead. Much to my delight, there was no error and it was the Trident Abyss. The all new Coercion HV3 coverstock (finished at 2000LSS) gives off a sense of pure hook in both sight and feel while the proven Turbulent core (2.49RG, .054Diff),the workhouse of the Trident line, is lurking beneath the surface. I could go into the typical details of how this heavy-oil ball rolls through the soup, but instead I will just say that this rock, the most hooking piece ever created for MOTIV’s lineup, will provide you with all the traction you need plus a bit to spare. Even with my low flare layout there is still no issue in getting this ball to read the lane and create its own friction to move towards the pocket. Make no mistake, this is a lot of ball on a typical house shot, so be prepared to dive deep even on the fresh. Prepare to dive into the Abyss! This ball is the newest introduction into the Trident line of MOTIV bowling balls. The MOTIV Trident Abyss features the combination of the Coercion HV3 cover stock and the Turbulent asymmetric core. This is the strongest ball ever made by MOTIV and is built to dominate in a flood of oil. Most importantly, it features the continuation through the pins that MOTIV balls are becoming known for. It will be a great fit in your bag on heavy oil. With the merging of a high differential with a low RG, the Trident Abyss creates maximum track flare to make the turn in deep oil. The Trident Abyss will become that ball you can count on when you need the ball to dig on heavy volume patterns. When I was told how much this balls hooks, I was honestly worried that it would burn up. To my excited surprise, it never even thinks about it. I have never seen such a big ball continue through the pins anything like this special ball does. My Trident Abyss is laid out pin down (below my bridge), the cg shifted to the right (no extra hole). This ball has already found a place in my bag and drives through the pins with easy from any angle. If you are looking for a ball that will hook on anything, provides control, does not sacrifice backend reaction, has continuation and awesome hitting power. Look no further, you've found it. 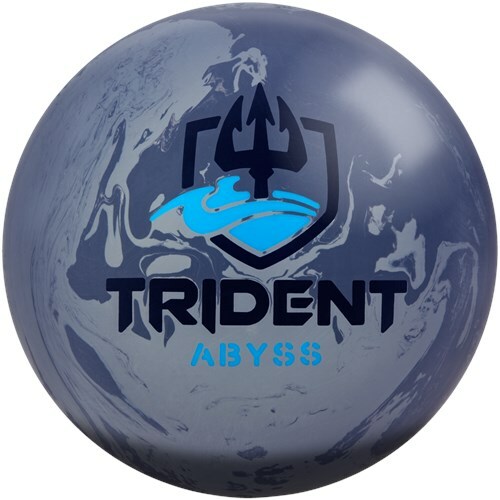 Motiv’s NEW Trident Abyss merges the Turbulent assymmetric core and the Coercion to create the strongest ball we’ve ever made! Finally got to throw this ball, and I was with speechless. The #StepLeft is real. My home center typically is heavier in the middles, but the Trident Abyss cut through the pattern and hit like a truck. I strongly recommend this ball for speed dominant or lower rev players and for higher volume/heavier oil patterns! I know this sounds backwards but my first true love of Motiv balls was the Trident Quest. I demolished the pins for the entire season last year. I liked the ball so much I decided to get the original Trident. My first day out at UBA with the OG Trident I shot 716. People tell me that the best time to buy a ball is when you are throwing well not when you are struggling. So along comes the Trident Abyss. Honestly I was waiting for the UPS man out in the street. I don't even think I stopped to appreciate the color of the ball. It doesn't have to be fruity to be beautiful. So in my backwards buying spree the Abyss turned out to be exactly what I expected a hook monster. My first experience was on a house shot and I just kept moving left. Normally I am a down and in player this ball helped me out of my comfort zone. I was able to keep moving left and not worry if it was going to comeback. The ball gave me mistake room. If I missed outside it came roaring back and If i tugged it held. I still love the Quest and the OG Trident but now I have that go to when I hit those drenched conditions. If you are not convinced go to YouTube and just watch some of the videos on this ball. Its more ball than I've ever had in my hand. The Motiv R&D team just keeps coming up with better ideas. Beware!! This ball is an absolute beast! Introducing the all new Trident Abyss! We drilled mine with a 30x5x30 layout. My pap is 4 3/4 over and 1/16 up. I've had the chance to throw this in a few tournaments now and all I can say is wow. This thing sure does hook! However what really impresses me the most about this ball is how clean it is through the fronts for such a "big" ball. I don't think I've ever been able to stay with the same ball that is as aggressive as the Abyss. I can start game one playing up the boards and am able to stay with the same ball and just move inside without it losing its energy. With the Abyss, say no more. I find this ball to not only be extremely versatile with layouts but with surface as well. If you want to shine it up and really watch it make a move on the backend you can do so as well. If I were to compare it to the Jackal Rising I would say that the Abyss is much cleaner and overall more aggressive. This ball is tacky!! MOTIV crushes it yet again with another phenomenal piece! Trident Abyss is the newest form of Motiv weaponry to combat heavy oil and possesses the same Turbulent core as its predecessors Trident and Trident Quest, the difference however in Abyss is Coercion HV3 reactive coverstock with an out of box finish of 2000 LLS. The cover is designed to provide traction on the heaviest of oil patterns. I consider Abyss to be the snow tire of snow tires because of the amount of traction it provides while going through the oil pattern effortlessly, it had no issue heavily standing up in the midlane with more than enough energy down lane to go through the 1-3. As the oil pattern transitioned it became a matter of moving left and as long as there was enough oil up front for me Abyss continued to do as advertised, because Coercion is s huge cover you will see no shortage of hook or recovery down lane. To the credit of Abyss it does create a fair amount of angle at the break point for the cover being as coarse as it is, granted it is not as angular as the Trident Quest but it’s still rather impressive. Abyss isn’t the type of weaponry that will checkmark off the spot but it will stand up and roll over, a trait I find most desirable in snow tires. Jackal Rising: The strength of between the two of them is the ability to overpower heavier patterns due to the coverstocks they possess, Coercion HV3 is bigger than the Coercion HV2 and is also earlier providing more traction overall. If it’s a snow tire you want then Abyss is what you’re looking for and should you want a smoother alternative go with the Jackal Rising. Jackal Ghost: Ghost is more angular on heavier patterns than Abyss is at the break point and is not as early as Abyss is, Abyss also has a bigger cover than that of the Jackal Ghost. I like the traction Abyss creates which is why it’s an easy choice when encountering heavy oil patterns, not only do I get a lot of traction but that traction is not lost when I have to move my feet left of target. As the pattern breaks down and the fronts start to fade it is not beneficial for me to continue to use Abyss out of box, it is best that I ball down as excessive friction is not beneficial to Abyss. Motiv has a record of creating weaponry that does as advertised as Abyss is no different, weaponry designed to combat the heaviest of oil patterns. Stare into the Abyss if you dare. Overview: Trident Abyss features the low RG/high differential Turbulent core wrapped in the Coercion HV3 Reactive Solid coverstock, which provides maximum traction on heavy oil. Review: The Trident Abyss flat out hooks and is continuous on the backend. I’m impressed by the continuation of this ball due to how early the ball reads the lane. Knowing this, I will know when I have the right/wrong ball in my hand. With its strong cover/strong core combination, I’ll be using this ball on the fresh on those longer/high volume oil conditions. The Abyss is about 2-4 more boards of overall hook and a couple feet sooner. It will also have a more defined shape off the friction whereas the SS will look smoother. Final Thoughts: Trident Abyss needs oil. It reads early and it’s continuous on the backend. It will be the first ball out of my bag on those longer/heavier volume oil conditions. The Abyss will be best suited for players with higher ball speeds, who are looking for more overall hook and those tournament bowlers looking to fill out the top part of their arsenals. This ball does 2 things HOOK AND STRIKE and it does both A LOT. If you want or need hook this is the ball to get. Not only will you move left with this ball it pounds the pocket and does not run out energy. I can’t say enough about this ball it is really just overall powerful ball. Just get this ball and #MOVELEFT of everyone else. The Trident Abyss has unbelievable capabilities compared to those earlier in the line. The Coercion HV3 Coverstock is so strong, but with an unreal amount of control, there is no doubt that the ball will absolutely hook. By far, this is the strongest I have ever thrown. I compared mine to my Jackal Rising and Trident Quest. While I typically like playjng smaller angles with the Jackal Rising, I naturaly played further left with the Abyss. The Abyss was able to create a shape that was able to play with the over/under as it was able to read early enough in the oil and not react as fast as the Quest when get the ball gets out earlier to the dry. The Abyss is an unstoppable force. For as big overall as it is, the signature continuation is still there even when getting deep and way inside. If you need something that hooks, there is no doubt where to look. Page created in 0.734 seconds with 22 queries.